Some might say that we came upon our trade naturally; others might say we have been called on the carpet all our lives. 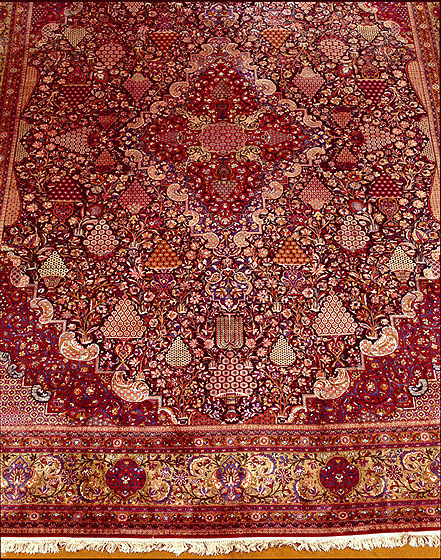 Our family traces its roots to Kashan, Iran, one of the major textile and rug weaving centers in Iran. The city of Kashan is world renowned for its fine quality wool rugs as well as its famed Mohtasham carpets woven in the 19th century. Kashan is where our grandfather, the late Hadji Yahouda Haroonian, became best known as a master in the field of high quality rugs. Here he began acquiring and manufacturing fine rugs in 1912, as well as exporting his personally selected pieces to Europe, North America, and Japan. Our grandfather must have had a premonition that our father would follow in his footsteps because he left a place called The West Coast to him, and to us. As it turns out, we have always had a preference for natural colors and fibers in our rugs; tradition matters and craftsmanship counts. Today's automated machine production cannot compete with the craftsmanship and quality of a true hand-knotted rug.. A prime example of our love for traditional rugs is The Rug Warehouse's popular Natural Collection. These remarkable pieces are hand spun in Afghanistan. Weavers use natural dyestuffs derived from native plants, vegetables, and insects. Their goal is to recreate the palette used by the Moghal court artisans three centuries before them. Their handicraft is a true marvel. These one-of-a-kind rugs are exclusively available through The Rug Warehouse. The passion we have for our art has given great benefit to a select group of clients including: designers, exclusive department stores, movie makers, individual collectors and rug lovers from around the world. Along with our interest in tradition and craftsmanship, we have another endearing quality. We are committed to value. If you like magnificent rugs, genuine and honest people, and want to keep a grip on your checkbook, you have come to the right place: The Rug Warehouse, where we make sure the magic is not just in the carpets. We are here on the shoulders of those who came before us and those who have left us too soon. Their standards, honesty, and care for doing the right thing guides us in our magic carpet ride to be the best business we can be. We shall always remember them. The patriarch of the family, Massood's career in the rug industry spans for over five decades. He followed in his father's footsteps in Tehran, Iran, and quickly established himself as a reputable and prominent rug expert worldwide. For over 50's years, Massood had clients located around the world in places such as Japan, Europe, and North America. In Iran, he was member of Board of Directors Iranian Carpet Export Council and official expert to the Ministry of Justice (during the reign of the Shah). In the United States, he became a respected member of Appraisers Association of America. Massood Haroonian had a perceptive eye for fine art, and an unrivaled reputation for treating his clients and vendors with the utmost respect and integrity. Our beloved older brother and uncle, whose claim to fame was his honesty and care for others. A man of dignity and service to humanity. He started his career in rugs with helping his father in the export trade. Once in Los Angeles, he was one of the founders of Haroonian Oriental Rugs, a company dedicated to trading and service of fine new and antique rugs. Moussa Haroonian, the youngest of the Haroonian brothers in Los Angeles, immigrated to the US at age 15 with his parents. After finishing with his studies in 1985, he joined his father Massood and brothers Dan and George in the family business of fine, new and antique Persian rugs. With his determination, dedication, and creativity, Moussa was instrumental in changing the direction of the business and helped make it a flourishing and successful one. His sharp eye in business and his innovative mind attracted close and friendly relationships with all major vendors in the U.S. as well as overseas. His kindness and morality taught all that knew him how to treat one another. His knowledge and passion of fine rugs has been a core reason why The Rug Warehouse is the business it is today.